If you are not yet ready to say, "Enough!" and go home there are two options for Saturday. One is a field trip to a habitat restoration site. The other is a shopping trip to two nurseries and Ladew Gardens in Maryland. A baker's dozen of us opted for the shopping trip. We drive along quiet roads. Corn fields are greening up. Slow down as we pass an Amish horse and buggy trotting along the roadside. Question - if cities have bicycle lanes does this region have carriage lanes? No matter. 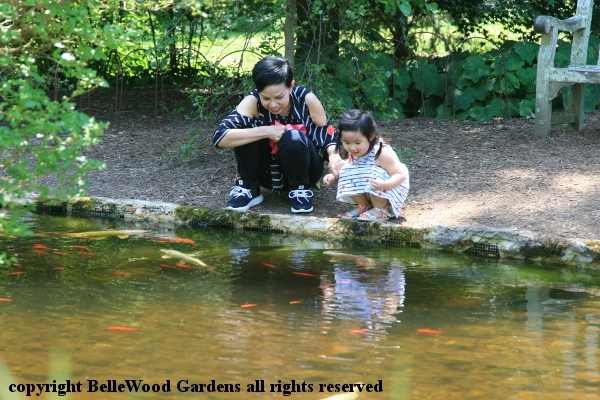 We arrive at Ladew Gardens in Monkton, Maryland. 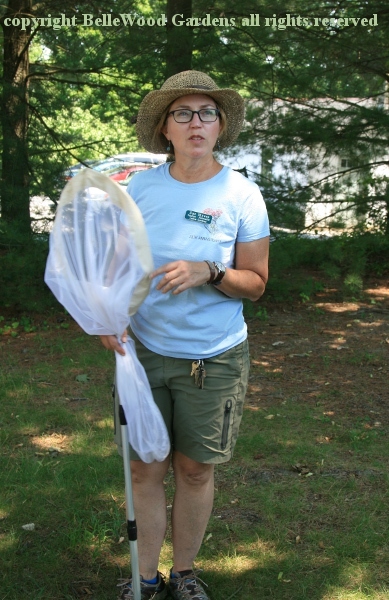 Sue Myers, staff naturalist, is waiting for us, butterfly net in hand. Our first stop is at their butterfly house. This is a special dispensation as it will not open to the public for another couple of days. And there is not much to see in the way of caterpillars (one) or butterflies (also one.) What is interesting is Sue's explanation of the structure and its management. For one thing, this butterfly house only displays native butterflies. 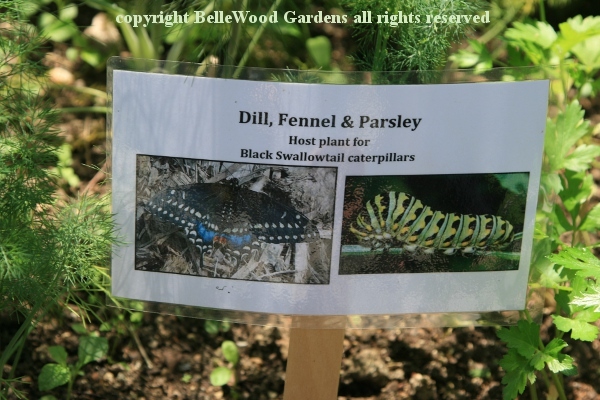 That means that they do not require the typical plethora of paperwork required by the majority of butterfly houses which display exotic butterflies. 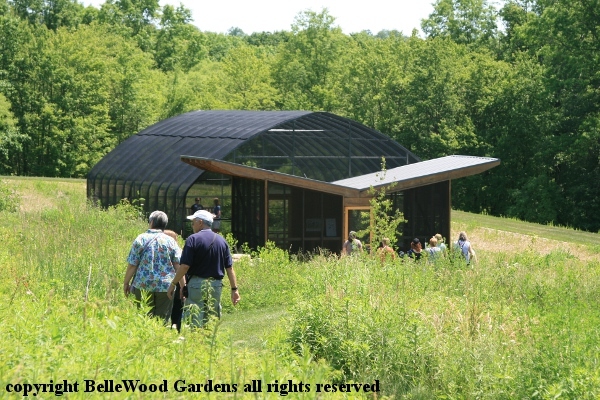 If butterflies escape from Ladew's butterfly house it makes no difference because they are already part of the local ecosystem. 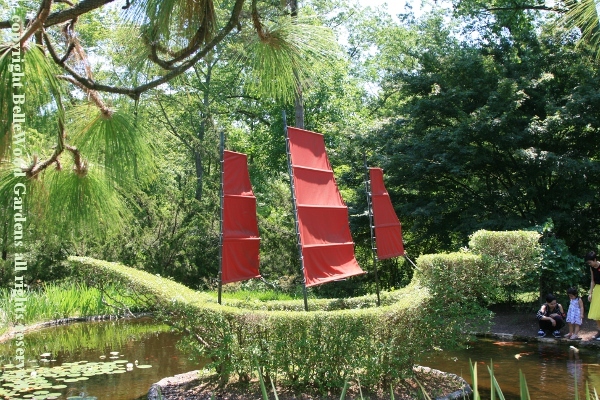 It also explains to visitors what they might find in their own gardens. 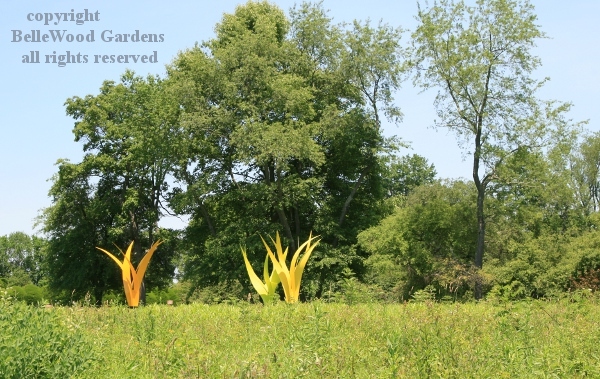 three painted aluminum poplar seed pods slowly twisting in a breeze. One of the side gardens near the buildings has numerous mahonia shrubs lavishly in fruit. 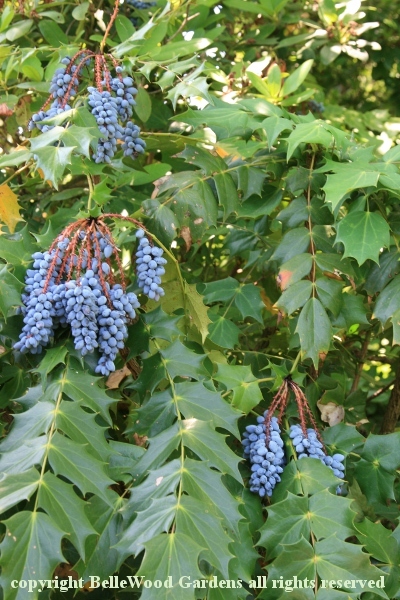 I would pick - mahonia makes a wonderful jelly - but it is not polite to do so in gardens or parks. Take only pictures, leave only footsteps. Besides, I don't have any plastic bags and the juicy berries would leak and stain. Maybe I could ask, if I make another visit . 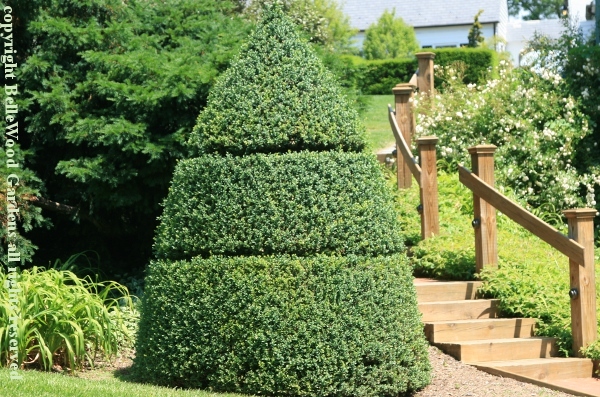 . .
A simple piece of topiary. 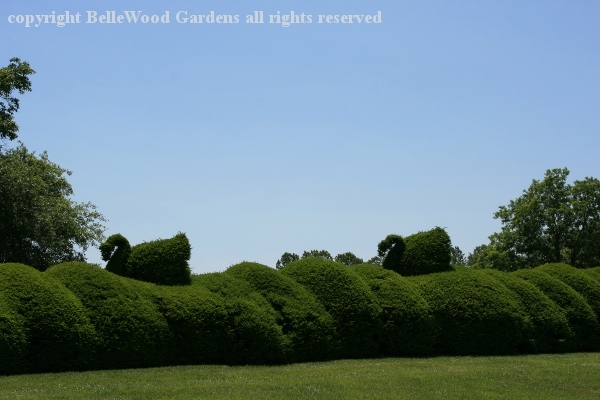 Ladew is renown, world wide, for its topiary, most especially a fox hunt, complete with fox, hounds,and hunter on horseback leaping a hedge. Unfortunately ill-mannered visitors have been sitting on the fox and hounds, damaging the vintage shrubs from which they are shaped. 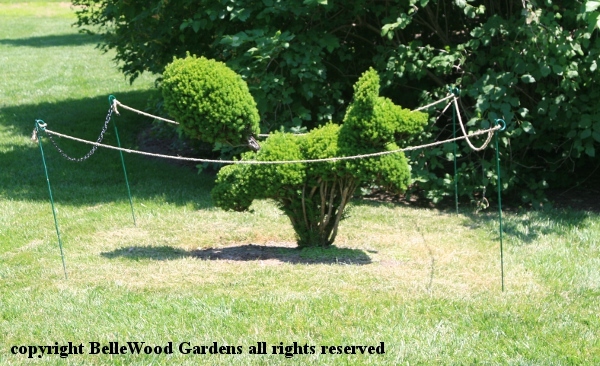 So the topiary has been roped off. 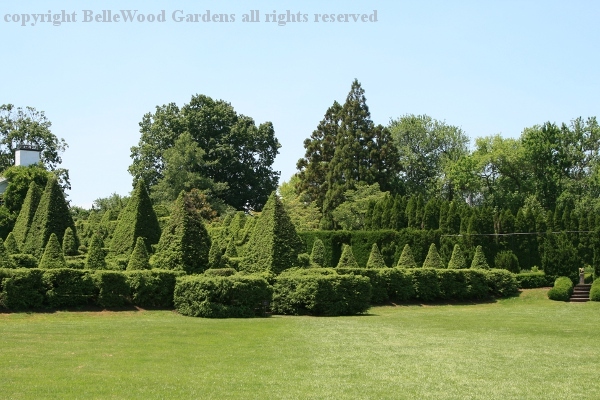 There's lots of geometric topiary - pyramids, spheres, and cubes. chortling with glee as fish swim up to nibble / kiss her fingers. on a croissant. Iced tea with lemonade. Then back to the bus.